ST. PETER, Minn. – The Gustavus women’s basketball team gained a 42-33 halftime lead and didn’t look back, defeating Bethel University for a series split Saturday afternoon at Gus Young Court during Senior Day. The Gusties, now 19-4 overall and 13-3 during Minnesota Intercollegiate Athletic Conference action, have tallied five consecutive victories. Emee Udo (Apple Valley, Minn.), Mikayla Miller (Goodhue, Minn.), and Miranda Rice (Forest Lake, Minn.) were honored prior to the game for their commitment to the women’s basketball program with pride and class throughout their collegiate careers. Miller led the Gusties with 24 points, shooting 6-14 from the field along with a season-high nine free throws, converting 9-9. Rice added 19 points from 7-19 shooting along with a team-high nine rebounds and Udo tied a career-high with eight points. After Gustavus headed into the second quarter down 19-18, they headed into the intermission with a nine-point lead, outscoring the Royals 24-14 in the second quarter. 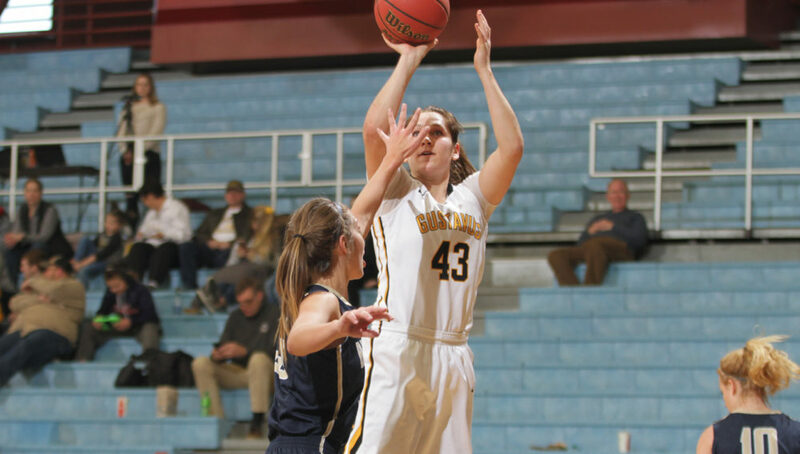 The Black and Gold collected its first lead of the game with two free throws from Miller seconds into the second quarter, and notched its largest lead of the half of nine points three times near the end of the half. Bethel shot 46.4 percent from the field (13-28) in the first 20 minutes, compared to a 43.2 percent mark from the Gusties (16-37). A 22-9 advantage in the third quarter propelled Gustavus to a 64-42 lead heading into the final 10 minutes. Two free throws from Rice gave the Gusties their largest lead of the game, owning a 69-42 advantage with just over eight minutes of play remaining. Gustavus limited Bethel to a 31.3 field goal percentage in the second half. “It felt like every possession mattered today and from here on out, every game has a playoff mentality. I think we’re playing really good basketball right now and our players are in a good place. Our seniors are felling good about themselves and are being strong leaders. I’m excited about the next couple of weeks, for sure,” Kelly concluded. The Gusties close out the regular season on the road next week, beginning with a matchup at Saint Benedict next Wednesday.